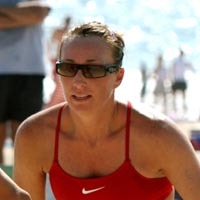 Meredith's best career finishes are seconds with Wendy Stammer at Santa Barbara in 2001 and with Kerri Walsh at Belmar in 2004. Shared the 1997 WPVA Rookie of the Year award with Elaine Youngs. Also competed on the four-person tour. Competed in volleyball at Pepperdine University, where she played for beach legend Nina Matthies. Starred in a Nike commercial with Nancy Mason and Carrie Busch. Personal: An elementary school teacher, she has taught at Richland Avenue Elementary in West Los Angeles.